5 Steps to Getting Perfect Prints, Every Time. FACT: Creating artwork for print isn’t the same as designing for web. “Visually correct” and “Technically correct” aren’t the same when it comes to printing. Unexpected design changes due to incompatible software, off print colors, delays brought about by multiple proofing rounds, confusing print jargon, frustration over the finished print… Do all of this sound familiar? With regard to printing, the planning and designing stages are most important in making sure there are no costly errors on the press, revisions, holdups, or even reprints. Take note of the outline below; and if you follow all these steps you’ll be sure to receive perfect prints well worth your time and effort. Especially for details (contact numbers, names, addresses) this is important. Don’t rely on spell check especially for multipage documents. If you’re making a new design version of your labels for product packaging, don’t skip this step just because you’re using the same text. Diligence is key. 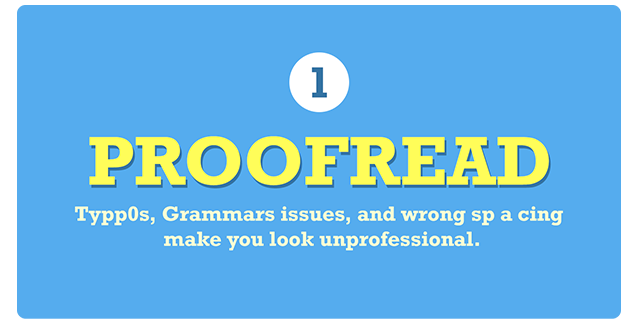 TIP: Most printers won’t touch your text to avoid making clerical mistakes. It’s your project–you can only guarantee correct content. While Photoshop is popular, this churns out files that are called ‘rasterized images’ or ‘raster’. For clean revisions and Final Art for press, you need to use software that works in ‘vector’ mode. In the simplest sense, with regard to print quality, the difference between ‘raster’ and ‘vector’ is that the former, when scaled, doesn’t maintain clean outlines. 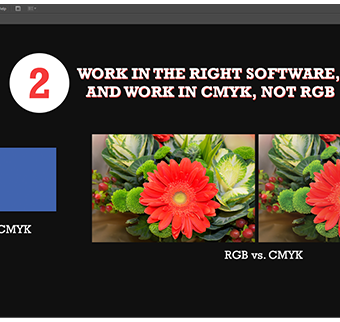 For photographs, you certainly can color-correct and alter with Photoshop; but for logos, packaging art, it’s best to work in software such as InDesign and Illustrator. Let’s go to color. Our monitors use combinations of RGB (Red-Blue-Green) light to transmit certain colors on your artwork, while we use combinations of CMYK (Cyan-Magenta-Yellow-blacK) to create your desired colors on print. Despite being able to ink thousands of colors, there will be colors (the really vibrant ones) that can’t be reproduced in CMYK ink (CMYK inks create black; RGB creates white light). You can DIY it. 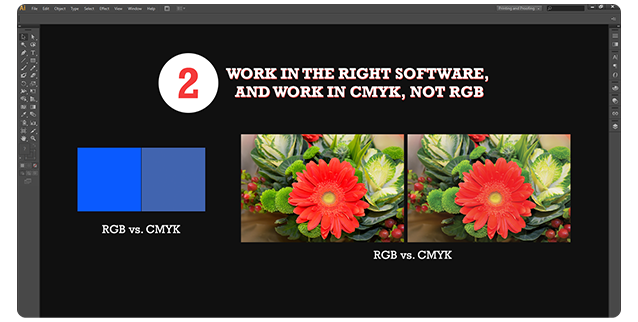 Get CMYK color builds to reproduce your RGB colors in CMYK. Use aPantone Process Color Guide and choose from over 3,000 swatches to help you build the correct color match. For really crucial colors like mentioned above, you also have the option for “Spot Printing”. Conversion can be done easily in most image-editing software. If you are unsure, talk to your printer about this. Calibrate your monitor to get a more accurate color representation. Once you do this, you’ll be able to see which colors vary, and which colors match. CRT monitors usually show the best color and resolution, while flat monitors (LCDs) are predisposed to limited resolution and poorer color quality. This is not a guarantee though, as calibration is tricky. You can always get special software, or you can opt for the more reliable ICC Profile that gets all your devices (scanner, camera, printer) “speaking the same color”. TIP: Calibrate/Color correct your monitor every month if you’re a designer, to ensure accuracy and reduce discrepancies with all your print designs. 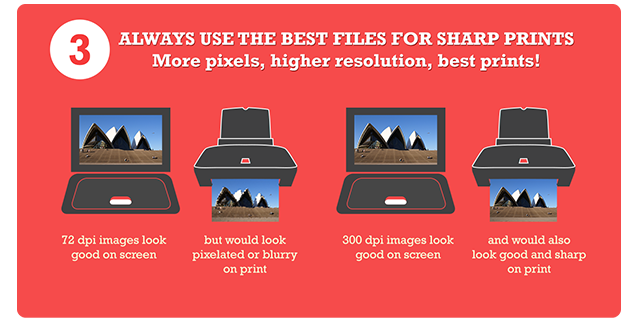 For all print projects, a resolution of at least 300dpi is recommended. Don’t rely on your monitor—you’ll find that a lot of images on the internet are set to 72 dpi for faster loading; but those images are smaller than is needed for large prints. Print is stricter—anything less than 300dpi and expect bad print quality. If you have a home printer, try printing different resolutions and you’ll know what I mean. 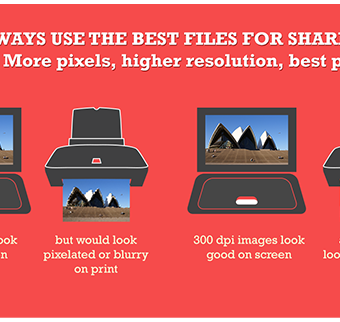 TIP: It’s always better to use a large file, and then scale down. If you do a quick fix by taking your original 72 dpi image, placing it on Photoshop, and saving it as 300 dpi, you certainly “increased the resolution” from 72 dpi to 300 dpi; but since the original image was already set in 72 dpi, you’re merely increasing the number of pixels (we call this “upsampling”) from that already blurry image. Fonts can also make or break your message. Legibility, style, effects—all of these are your best tools to draw in your reader’s eye, giving your artwork personality and distinction. Some will say that this step is irrelevant. But at Inkable Label Co’s HQ, we’ve been through issues with fonts and have experienced too many delays to say otherwise. 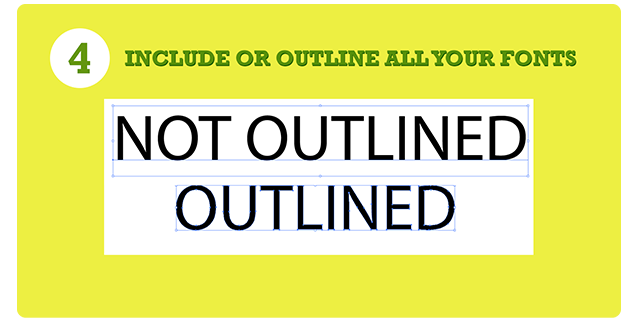 There’s a way to get your fonts looking 100% the way it should look, and this is by including or outlining your fonts. If your printer doesn’t have your specific fonts in their computer, or if your fonts aren’t embedded properly, they will read as “missing”, and systems automatically substitute this with another font. It’s the same as well with kerning (spacing in between letters and lines) and word wrapping. TIP: Either send the font file/s along with your artwork (for Mac this would be in System/Library/Fonts, and for Windows C:\Windows\Fonts), or outline your fonts. 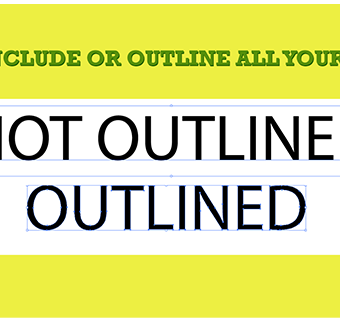 “Outlining” is literally making outlined letters of your text, and saving them as vector-based images. 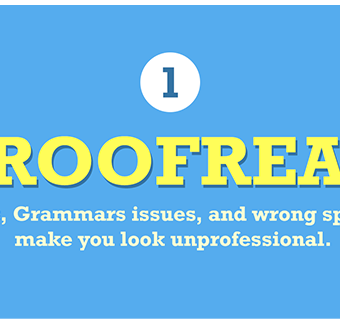 By outlining your text, you lessen the chances of someone meddling with your hard work. For example: If you’re printing a 4cm x 4cm custom label, your working size must not be bigger or smaller. Actually, if you were printing the above, your final artwork should measure 4.3cm x 4.3cm. Why? We’ll discuss why in a sec. Apart from making artwork for print in its actual size, to ensure art elements aren’t cut off, you get your prints from edge-to-edge, and so you get centered designs every time, familiarize yourself with the Printer’s Guidelines, and incorporate these into your design. Printer’s Guidelines are your best friends. 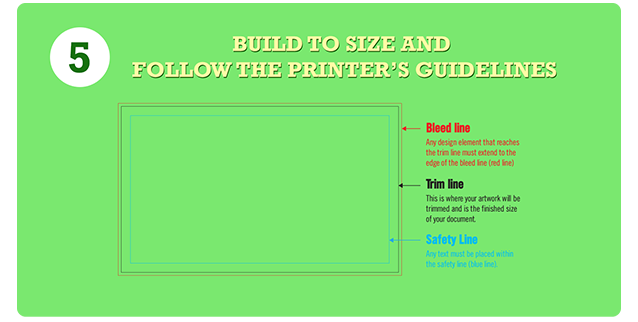 The part of your artwork that extends to the Red lines indicates the “Bleed” – this should have all art elements that you would want to print edge-to-edge. Since no machine can print exactly to the edge, this gives us comfortable tolerance for trimming, without getting slivers of white space on the sides. 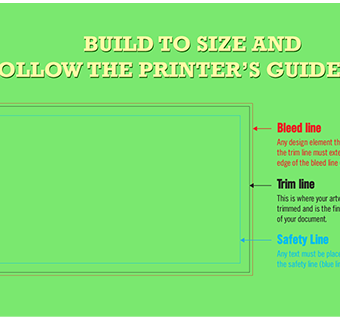 Bleed would usually be at 0.3cm, but consult your printer and follow their setup. This is why the above example would need to be a bit more that the actual size of your demo labels. Blue would denote the “Safety Margins and this encloses the “Safety Area” – any important details (logo, text) should be in this area so that nothing in this area gets accidentally cut off once we run the prints through our trimming machine. Black lines/black box would show you your final, finished print, as you would receive it. This is where we cut your printed pieces, a.k.a., the “Trim”. Whether you’re a seasoned designer, just starting out, or a small business that needs print collaterals, it’s always best to learn about the correct ways to prepare files fso that you achieve results that you are happy with, both on screen, and on print. Inkable Label Co. is an online printer that specializes in 100% custom labels. For a free consultation, you can visit them at www.inkablelabel.com.